I would like to say thank you to all of visitors to Mgluaye's Pages. As you all know that I had uploaded 2011 English Myanmar Calendar for third year round as in 2009 and 2010. Last two years, I got a few downloads of my calendars in previous two years. Calendar for 2010 was downloaded 65 times for whole year and calendar for 2009 was downloaded for 75 times each. 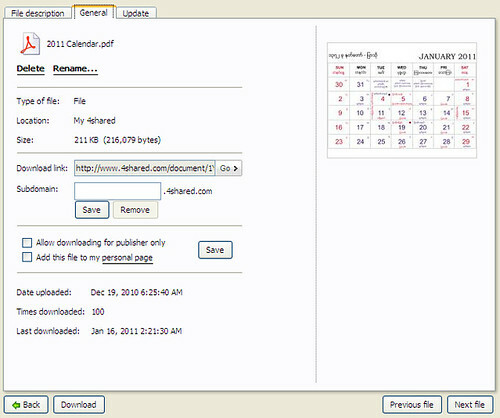 But for this year, 2011, the English Myanmar Calendar of 2011 was downloaded 100 times until today. As of it was uploaded in December 19, average download per day is 3.5714 as of it has been downloaded 100 times within 28 days. I hoped you all would like to ask me what kinds of benefits I received for those download. My benefit is as follow: let say I had used 10 hours for preparing this calendar to be able to upload in this PDF format, I used 10 hours from my personal leisure time to do this. Therefore, the value for this calendar is 10 hours period of time. Then, every time one download received for this calendar, it means that I am giving away 10 hours period of time to those who download it. Now, I had received 100 times count of download for this calendar, it means that I had shared 100 x 10 = 1,000 hours of leisure hours to all of my friends who has visited and downloaded it. This is my benefits from sharing. That's my pleasure of giving away my leisure hours to those who need it. So, that's why I would like to say special thanks to all of visitors to my blog. If you didn't received this calendar yet?? Just download here. It will benefit you by fulfilling your needs and to me as well. Thanks, really cool idea. Wish u for all the best. let me let you know, you will have hit the nail on the head.